Argentinean painting culture comes from a linguistic crossbreeding. The immigrants' movements have left their mark on Argentinean painting. Until the 1970's, artists sought in Europe a position to work and be in contact with an environment favorable for their creations. Today history is written in a different way, and the above balance takes place alternatively. This land in the South Cone has its loves and emotional fragility and the doors always open for all the people who want to settle on its soil. From this reality springs the "Borgean cosmopolitism", we're children of a cosmopolis. 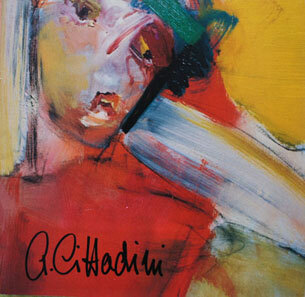 The painting of Alicia Delia Cittadini is built upon this cultural crossbreeding. I believe her language is a clear point of reference of end of the century expressionism, where informal movement is capitalized, reaching a new figuration as a result of this fusion. Buenos Aires, April 28 of 1997. .Rosa Faccaro. Member of the Argentinean and International Association of Art Critics.